Who says you have to be in Rome to do as the Romans? Here's six liqueurs to stock a bar like an Italian. As a popular bitter Italian liqueur, Campari is commonly sipped as an aperitif (before a meal). Its blazing red color comes from steeping fruits and herbs in a combination of alcohol and water. Use Campari to make a simple homemade cocktail by mixing it with soda water, citrus juice, or Prosecco. Depending on the brand, it can be made from apricot pits, almonds, or both. Although it can be used to make tasty cocktails such as the famous Amaretto Sour, it can also be used to add a rich almond flavor to baked goods. This iconic orange drink is made from bitter orange, rhubarb, gentian, and cinchona. The most common cocktail made with Aperol is known as the “Spritz,” which is made with Aperol, Prosecco, and soda water, and is served as an aperitif in northeast Italy. Pucker up! This popular lemon liqueur packs a sweet and zesty punch. Traditionally, Limoncello is consumed in Italy after a meal, as a digestive. However, it can also be used in cocktails and mixed drinks due to its strong flavor and lack of bitterness. Similar to Ouzo, this clear anise-flavored liqueur is commonly consumed in Mediterranean countries. It’s made of distilled aniseed, simple syrup, and licorice root extracts, and can be enjoyed straight or combined with rum, gin, brandy, water, or citrus juices. Originating in Italy, this fortified wine is flavored with roots, barks, seeds, herbs, and spices. It’s a common ingredient in Martinis, Manhattans, and Negronis (a combination of gin, sweet vermouth, and Campari—a bright red bitter Italian liqueur), which are served as aperitifs. There are several different styles of Vermouth, ranging from sweet to extra dry. For storage, you'll want to keep Vermouth in the fridge. 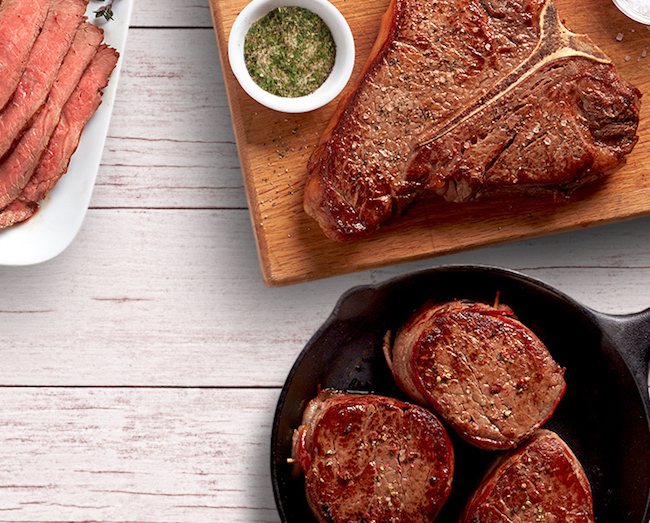 Because if you're gonna grill steak, why not make it the best?